Toyohara Kunichika (1835-1900) Twenty-four Examples of the Meiji Restoration: The Western Umbrella, 1877. Oban. This splendid print is fascinating on so many levels, not least as an historical record for umbrella enthusiasts. The Meiji restoration in 1868 was the cause of civil war skirmishes and some unpopularity amongst the Japanese public. Part of the country (principally the merchants) were enthusiastic about the new chances that open trade with the west would bring. Others, who were more traditional, feared the erosion of Japanese identity and were deeply suspicious about modern innovation. This print is a parodic manifestation of that anxiety and distaste. The cartouche depicts a Japanese man in traditional dress holding a modern western umbrella and nearly being swept away by the wind. His situation is deliberately comical and ungainly. 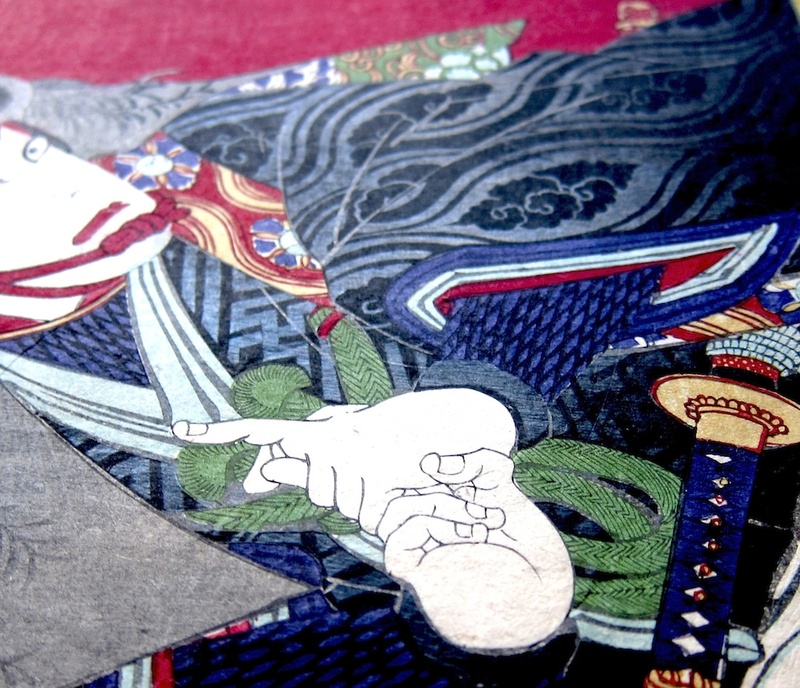 The main subject of the piece represents an actor in traditional samurai dress, solemn and in a moment of theatrical emotion as shown by his mie expression. 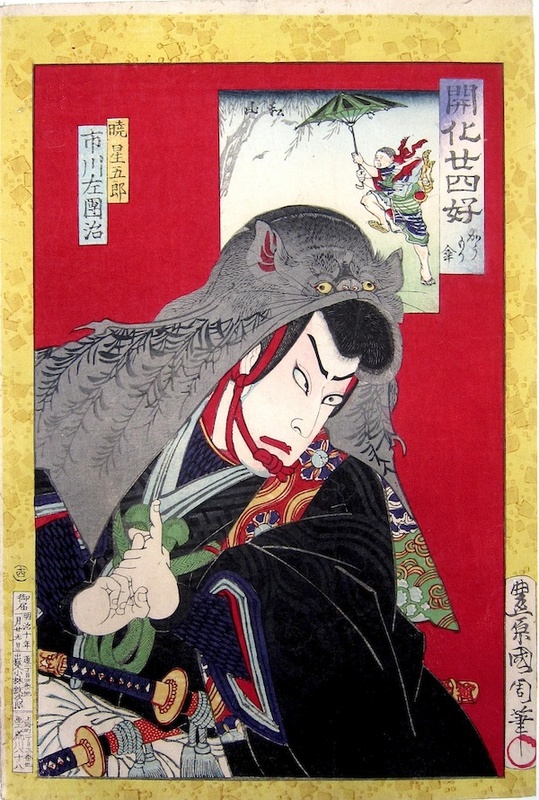 Kunichika has draped a comical bat across the actor’s head in imitation of the black umbrella, pictured behind in the cartouche. There is a smart visual pun intended here between the black of the bat’s wing and the black wing-like cut of the umbrella cloth, but there is a deeper meaning at work as well. Kunichika is showing how traditional values are demeaned by the new modern Meiji administration. This print is openly critical of innovation and presents the traditional and noble culture of Japan as being demeaned by western changes. An important and unusual print in very fine condition. The colour and impression are excellent and the image is full size. There is a striking black on black burnishing of floral decoration to the kimono (shomen-zuri). The border is printed yellow and not yellowed with age. A really excellent piece.